Not only was Friday’s El Reno tornado the widest on record, but it was also flanked by an incredibly rare tornado that rotated in the reverse direction. The National Weather Service confirmed Tuesday that a rare “anticyclonic” tornado touched down about three miles southeast of the monstrous 2.6-mile wide EF5 tornado that killed 9 people, including four storm chasers. 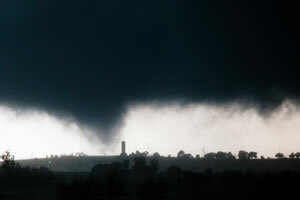 An anticyclonic tornado is one that spins clockwise rather than the conventional counterclockwise (cyclonic) direction. Precious few tornadoes are anticyclonic, and, of those, most are typically in the form of waterspouts or non-supercell thunderstorms (i.e. thunderstorms without a rotating updraft).